elobeatlesforever: Secret Messages 2LP & ELO Singles Box Soon? The intriguing prospect of ELO's 1983 album "Secret Messages" being reissued on vinyl is on the agenda as at least two European online vendors have begun listing it with a current release date of Friday 3rd August 2018 (having slipped 5 weeks from Friday 29th June). 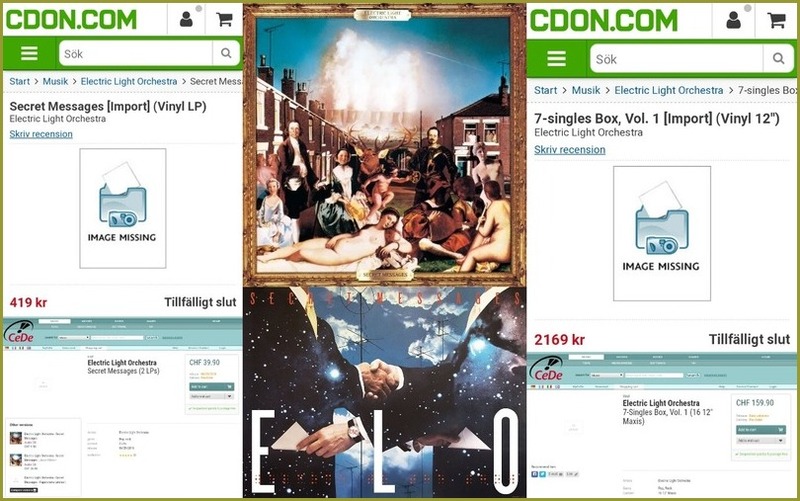 CDON.COM in Sweden cite "Secret Messages" as an imported vinyl LP whereas CeDe.ch in Switzerland have it as a 2LP issue raising hopes of the release being the long awaited originally intended (JETDP402) eighteen (18) track edition hinted at as far back as 2013. Both sites are also quoting the release of a package entitled: 7-Singles Box, Vol. 1 (Vinyl 12") too to further grab the attention of ELO collectors and fans this coming Summer. There is no official mention yet of either release by Sony Legacy but Yours Truly KJS has some thoughts on the prospect of a "Secret Messages" LP (and/or CD) reissue later this year. If a 2LP set is forthcoming, it begs the question as to whether it will contain "Beatles Forever". If so, it will fully celebrate the 35th Anniversary of "Secret Messages" and bring to an end the nine (9) year campaign by elobeatlesforever (elobf) for its release. If not, it will likely resemble the 2001 remastered expanded CD, being quite a departure by Sony Legacy whereas all previous ELO vinyl reissues have copied the original release. This writer would be surprised if an eleven (11) track "Secret Messages" was spread over two discs. It's also not clear, at the time of writing, as to whether another coloured vinyl set is on the way. "Yep, its coming but I wasn't involved in it. I was involved on another ELO project." So two (or more) archive releases this year? What a time to be alive! What means whether it will contain "Beatles Forever"? Is it song by ELO? I have this feeling Beatles Forever is on there as a hidden track. Think about it. It's called Secret Messages. If i'm wrong i apologize for putting this thought into your head and i feel Jeff has missed a trick here.